Imagine waking up, ambling out to the front porch of your Alamo Lake cabin, and being met with another gorgeous Arizona day on the lake. After your thoughts have cleared from a secure, comfortable slumber, you begin to realize the adventure potential of your day. Should you fish for bass in this world-renowned fishing destination? Maybe take a hike to find and appreciate the area's diverse wildlife and birds...Or perhaps you could hop onto a dirt trail with your 4-wheel drive (or OHV) and experience this gorgeous slice of desert with the wind in your face. You know, there's always the potential to simply relax, recharge, and take in the beautiful scenery. We'll provide the place to stay in a scenic location, but you bring the adventure! Camping Cabin reservations are available online or by calling our friendly folks at the Arizona State Parks Reservations Desk at 1-877-MY PARKS (697-2757). They are available seven days a week from 8 a.m. to 5 p.m. Arizona time. There is a $10 non-refundable reservation fee per cabin. 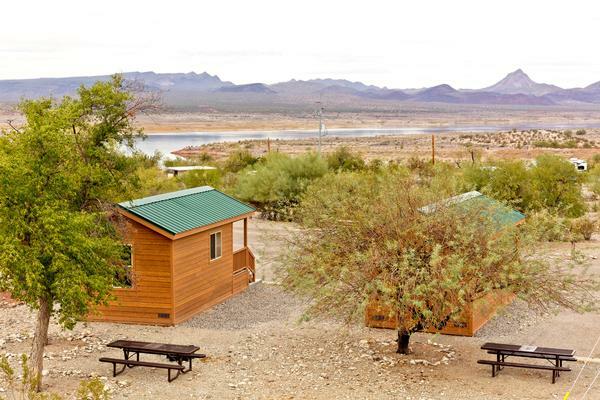 Alamo Lake State Park offers four camping cabins that overlook Alamo Lake and the gorgeous surrounding desert. Each cabin features a covered wood porch and comfortable features. Cabins are furnished with two single, bunk style beds with mattresses (four beds total), one table, four chairs, electricity, two ceiling fans, lights, heat/air conditioning, and a lockable door. Campers must supply their own linens. 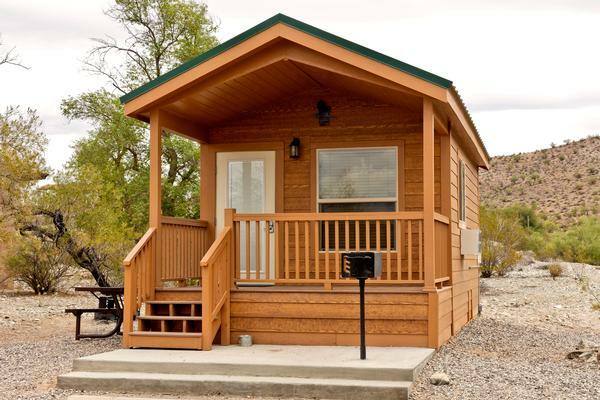 Cabins are accessible by car and RV and equipped with water and electric hook-ups outside. A picnic table, fire ring & charcoal grill make for a well-equipped outdoor setting. Cabins sleep up to four people, with a maximum capacity of six people. Guests may use personal cots or blow-up mattresses to create additional beds. Restrooms and showers are within walking distance. Please remember to print a copy of your confirmation and bring it with you to assist with your check-in. Cabin Fee: $65 per night. Reservations are confirmed by receipt of an application and approval of a credit card (Visa/Mastercard only). Full payment is required at booking. Rental rates are charged per night. 14 nights maximum stay length in any 30-day period. Pets must be declared upon reservation. There is a pet charge of $5.00 per cabin per day and a limit of two pets per cabin. Smoking and cooking are prohibited in cabins. Fires are limited to barbecue grilles and the fire pit. Cabin guest must ensure that the cabin is left clean and undamaged. Cleaning and damage fees will be billed to the credit card on file. Vehicles: Each vehicle must display a permit on the rear view mirror of their vehicle indicating payment of fees. Maximum two vehicles per cabin. RVs also requiring hook-ups (water and electric) are charged the standard overnight fee. Cabin Occupancy: The rental party must comprise at least one person 18 years of age or older. Occupancy is a maximum of four adults not to exceed six persons total, including children. Tents: There is a tent fee of $15.00 per night. The tent must be declared upon reservation. The tent must be placed within 10 feet of the cabin.